This is one of the very best in the Muscular Punishment series and a "can't miss" for you Brad fans! In this feature see Bodybuilding Champions Kyle Stevens & Sean Moore show Big Bad Brad Hollibaugh that they are capable of continuing the dishing out of "muscular punishment " and taking care of the family business!!! Kyle and Sean look huge in this video and Brad, well he looks like the unbelievable Brad of course! Great video quality and lots of scenes you wrestling oriented fans will enjoy! Muscle mass & strength legend Brad Hollibaugh walks into the gym of Johnny Bravo to let him know a new Muscle King is in his town ... That doesn't sit very well with the Ultra Muscle & Power of Johnny Bravo! Watch these two muscle beasts tough talk, pose down, arm wrestle, tape measure. Then the grand finale taking place on Fort Lauderdale Beach to find out who will be crowned "King of the Beach" in a No Holds Barred wrestling match ! Can the amazing size & power of Brad Hollibaugh finally be defeated after so many years? Especially since Big Brad is only a mere 270 plus pounds of his normal inhuman 315lbs. of superior muscle & power over everyone? 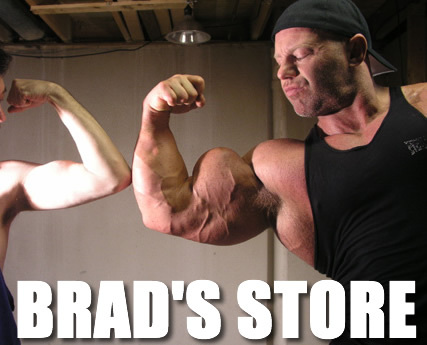 Can the past few years with Brad's set back & surgery give 6'1 280lb. Johnny Bravo the edge he needs to be the new King? Watch and find out as these two amazing athletes, champion bodybuilders and both undefeated wrestling champs go head to head for the title of "King of the Beach" !! !